Canine aggression can cause a lot of embarrassment for the owner, as well as possible physical and monetary damage. I recently worked with a woman whose pit bull terrier, Idgie, was exhibiting such erratic behavior, she was asked not to bring the dog back to doggie daycare and was unable to take her to the dog park for fear of Idgie lashing out at strangers. Within the home, Idgie’s behavior was similar—she exhibited aggression toward trucks, people, and other dogs during walks. Uncovering the root cause of a dog’s aggression is the first step in fixing it. I performed an in-home consultation to get to know the owner, Idgie, and observe the problem behavior firsthand. Upon meeting me, Idgie laid her ears back, barked, and hid behind her owner. It wasn’t until we’d all sat down together at the table she allowed me to pet her. Still, Idgie never truly relaxed. She stayed on alert and barked at passing dogs through the window. Although she began feeling comfortable around me after an hour or so, it became pretty clear to me that Idgie was suffering from fear aggression. Fear aggression is exactly what it sounds like. A dog is afraid of noises, people, animals—basically anything unfamiliar—and lashes out in an attempt to protect themselves. In Idgie’s case, we focused on building confidence and restoring calm behavior. We created a safe haven for her by assigning a specific spot just for her within the house, where she could see and be a part of daily activity without prowling and acting jittery. She learned to view this as a calm space, and it helped her realize she can stay calm outside of that space, as well. We worked on proper leash handling techniques as well as basic obedience, both of which were designed to help the owner communicate with her dog. By establishing this bond of trust between Idgie and her owner away from upsetting stimuli—then slowly reintroducing that stimuli—we kept Idgie’s level of confidence high and her owner in a position of leadership and gentle control. This program worked for Idgie. 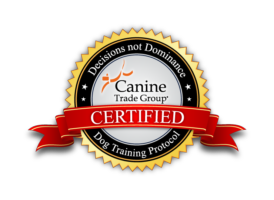 To see what kind of program might work for you and your dog, give Beltway Dog Training a call today at 202.318.1380.